Ryan Castalez, of Discourse coffee in Sister Bay, holds a hot cup of “Smoke Tricks,” a smoky, maple-infused espresso drink. Photo by Len Villano. In the wintertime spice cabinet, ginger reigns supreme. Whether it’s the fresh rhizome that lends a sharp, spicy touch to soups, stir fry and teas, or the subtle, ground version that gives a warm, spicy bite to gingersnap cookies and pumpkin pies, winter is the time for this knobby root to shine. Ginger does more than lend a subtle kick to dishes, drinks and desserts — it also boasts compounds that contribute to health and healing. Considered a natural medicine in holistic healing systems, it aids digestion, reduces nausea, remedies cold and flu, reduces pain and inflammation, and helps maintain healthy blood sugar levels. In a nutshell, it’s the go-to antidote for winter ailments. 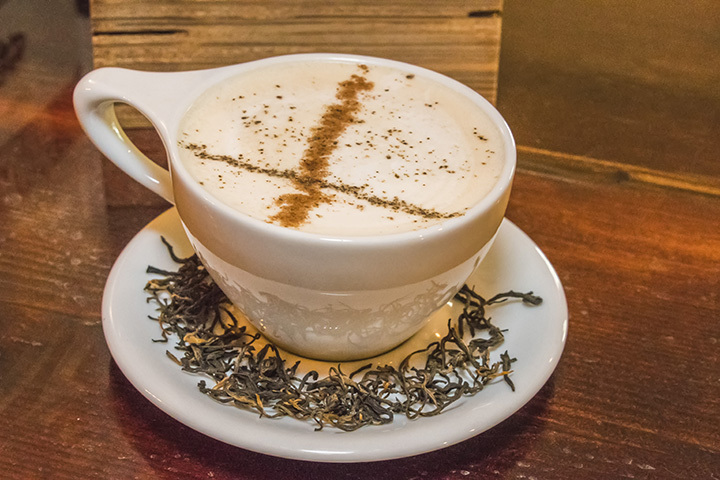 To learn how to infuse this fresh, aromatic root into delectable wintertime drinks, I made my way to Discourse coffee in Sister Bay to learn from owner and coffee enthusiast Ryan Castalez. He whipped up two ginger-inspired menu items for us: Smoke Tricks, a smoky, maple-infused espresso drink, and a spicy Warming Winter Chai. Castalez had two goals in mind when crafting these comforting concoctions. Contrary to popular belief, espresso is not a specific type of bean but a method of brewing coffee. It is accomplished by forcing a small amount of hot water under pressure through finely ground, compacted dark roast coffee. 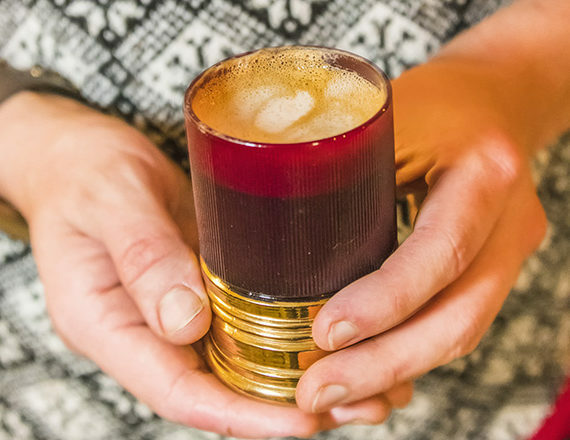 Though typically made using an espresso machine, there are two simple ways to make it at home. The easiest way to replicate espresso is through an AeroPress, Castalez explained. Using the numbers on the side, fill very fine coffee grounds to Line 1 and water just off a boil to Line 2. Let steep for 30 seconds and plunge for 15 seconds. The next easiest way is through a stovetop espresso maker. As they come in different sizes, refer to instructions on the best coffee-to-water ratio. In a Mason jar, muddle fresh turmeric and ginger with one cup filtered water. Add organic blackstrap molasses, one additional cup of filtered water, rum extract and maple syrup before gently shaking the mixture and leaving to rest in the refrigerator for 24 hours. Strain through a fine mesh sieve. Traditional Method: Add all ingredients except sugar, tea and vanilla bean to a pot and simmer for one hour. Add tea and vanilla and maintain a very low simmer for 12 hours. Remove from heat, strain onto sugar and incorporate. Serve with equal parts milk. Alternative Method: Add all ingredients aside from sugar and bring to a rolling boil for 7 minutes. Remove from heat, strain onto sugar, and incorporate. Serve with equal parts milk.